Whether setting up a small food court for the workplace or a large food court for the public in an area such as a mall or an airport, obtaining the proper receptacles is one of the keys to keeping the food court clean and running smoothly. At Securr, we offer two different receptacles that are specifically designed for the needs of a food court. Here is a closer look at the two options from which you can choose. The 36-gallon food court waste receptacle is designed specifically to withstand high-volume food court operations. In addition to safely storing waste behind a two-point locking latch, the receptacle is capable of accommodating a 20” x 17” tray on its top. In this way, consumers can easily dump their tray while placing it in an area that is easy for workers to locate and clear away. To help make it easier to remove the waste from the receptacle while also reducing the risk of back injury, the receptacle features a side-opening service door. For added durability, the receptacle is made from corrosion-resistant galvannealed steel and high-grade UV-resistant powder coat. In addition, all handles, hinges, hardware and striker plates are zinc coated for corrosion resistance. As such, the receptacle comes backed by a one-year warranty and are safe to use in places with high humidity, fog, salt spray, ultraviolet rays, chemicals and abrasion. This model, which can also be used for a towel return at poolside locations, weighs 175 pounds and measures 20 inches wide, 46 inches high and 20 inches long. It is available in black, forest brown, olive green, fir green, sky blue and white. The 72-gallon double food court waste receptacle allows you to store twice as much waste as the previous model while also offering twice as much space for tray storage. Capable of accommodating two 20” x 17” trays, this model is also made from corrosion-resistant galvannealed steel. With its high-grade UV-resistant powder coat, this mode is designed to last for many years to come. Like the previous model, the double food court waste receptacle features a side-opening service door. 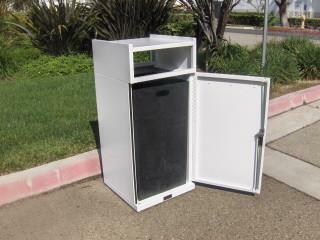 In this way, the waste can be easily moved without lifting it out and risking injury to the back. All of the handles, hinges, striker plates and hardware are also coated with zinc, providing an extra layer of corrosion resistance. Meanwhile, the housing and doors are made from 12-gauge steel. 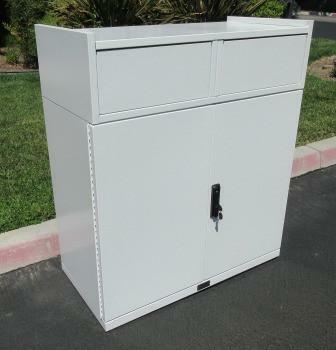 Like the previous model, the double food court waste receptacle comes complete with a two-point locking latch and is available with the optional push-in loading doors for added protection of the contents. The 72-gallon double food court waste receptacle weights 140 pounds and measures 20 inches wide, 46 inches tall and 40 inches long. Like the previous model, it can also be used as a towel return receptacle near poolsides and is available in black, forest brown, olive green, fir green, sky blue and white.